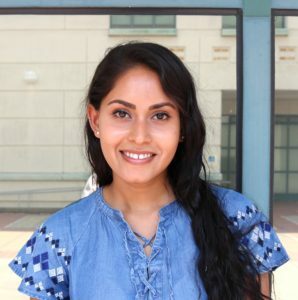 Snigdha Chatterjee (AS ‘ 17) is enrolled in the Plant and Microbial Biology Program at University of California, Berkeley where she is pursuing a PhD in Plant Biology. She is still doing lab rotations to acquaint herself with the different research in the program before she chooses a lab in which she will conduct her doctoral research. For her Honors capstone project, Snigdha conducted research on the role of a Jumonji-C domain containing histone demethylase in plant defense against bacterial pathogen. Her research findings showed that this particular demethylase was a negative regulator of pathogen defense in Arabidopsis thaliana. Working on her Honors capstone project helped Snigdha develop research organization, writing and presentation skills, which have proved invaluable in graduate school. Snigdha’s remarkable academic achievements are exemplified in the numerous awards and honors that she received while at Syracuse University where she was both a Founder’s Scholar and a WellsLink Scholar. The awards she received included the 2017 Outstanding Achievement in Biotechnology award, the Dooley Ornstein Reisman, Robert Charles Ornstein, & Lt. Adolph Ornstein Scholarship (2015 & 2016) and the Lynne Parker Scholarship. She also won the American Society of Plant Biologists Summer Undergraduate Research Fellowship and Travel Grant (2016) and the Norma Slepecky Undergraduate Research Prize (1st place). In addition, she was an Honorable mention for the NSF Graduate Research Fellowship (2017) and the Barry Goldwater Scholarship (2016). Snigdha acknowledges that although incorporating Honors requirements in her class schedule was a challenge, she became a “more well-rounded student” as a result of taking Honors classes and fulfilling other requirements such as civic engagement. She credits honors staff for their invaluable guidance and advice. She is also grateful for the guidance she received from Jolynn Parker, the Director of the Center for Fellowship and Scholarship Advising, when applying for nationally competitive scholarships and fellowships. Snigdha’s advice for current and future Honors students is, “… to not feel shy and ask questions and take advantage of all the resources that the program has to offer”. She also advises them to start the capstone process as early as possible. “I do not think that anyone could ever start too early”, she says.